When we move beyond transaction and embrace the transformational journey that is embedded in the adoption experience, we have a better chance of ensuring strong families. What is the state of adoption in America today? Honestly, it depends. It depends on where you live because our laws vary widely from state to state. It depends on who you love because even with a win for marriage equality, the rights of the LGBTQ community aren't recognized everywhere. It depends on how much money you have because the private and public adoption systems are worlds apart. It depends on where your adoption path begins: foster care, private agency adoption or private adoption with an attorney. It depends on whether or not you view adoption as a one-time transaction or the lifelong transformational journey that it truly is. Too often, adoptions are fraught with challenges that negatively impact adopted persons, first/birth families, foster/adoptive families and the people who love all of these people. These challenges go well beyond the individual and can impact our wider world. When we recognize the life-long impact on all involved, the extended family of adoption can truly represent an evolved definition of family. When we move beyond transaction and embrace the transformational journey that is embedded in the adoption experience, we have a better chance of ensuring strong families. Adoption has been evolving away from secrecy and shame and today 95 percent of adoptions have some form of openness which we know is healthier and better for children and families. The rights of the LGBTQ community are expanding in so many ways. The movement to restore access to original birth certificates is not only gaining steam, but resulting in wins throughout the country. These changes in adoption are embraced by the public and the adoption community, with majority support for more openness, access to original birth certificates, support for LGBTQ adoption rights, more funding for pre- and post-adoption services, and a critical examination of the role of race, class and culture in adoption. This represents a tremendous opportunity to continue our progress and advance the reforms that we need to strengthen families. Adoption laws, policies and practices differ widely from state to state and have not kept up with the ever-evolving definition of family. The unintended consequences of this lack of uniformity, coupled with a lack of education, can lead to fraud, coercion, undue stress on families, and ultimately, leaves children vulnerable. Families (expectant, first/birth and adoptive) lack access to quality pre- and post-adoption services, authentic options counseling and adoption-competent professionals. Due to current state laws, most adopted people cannot access their original birth certificate even after turning 18. Having information of one's biological origins is a basic human right and contributes to overall healthy development, both physically and emotionally. The unique experiences of the adoption and foster care adoption communities are rarely considered in the systems they interact with on a regular basis. For example, teachers and doctors that are unprepared to support non-traditional family systems can unintentionally demonstrate insensitivity through marginalizing language, macroaggressions and unfair treatment. Young people who age-out of the foster care system without being adopted are over-represented in rates of incarceration, suicide and substance abuse. Issues of race, class and culture are rarely addressed in a truly transformational way and can make the challenges even more difficult for families and adopted people. Researchers, effective practitioners and healthy families know what works and know that positive change is not only possible, but also necessary and urgent. Best practices in adoption call for the highest ethical standards, openness, mindful parent preparation and healthy identity development for adopted people and parents. It's time we move away from a fractured and transactional adoption process to a more uniform and transformational process where everyone - expectant parents, first/birth parents, adopted persons and adoptive families - are better prepared and supported. 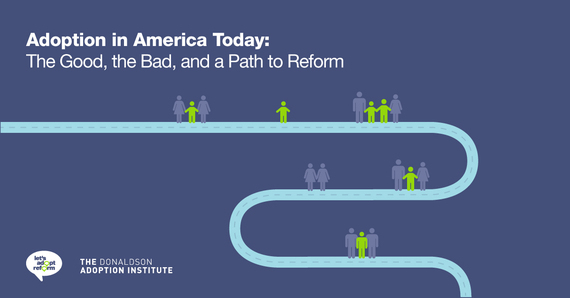 We must honor the good, acknowledge the bad and commit to a path toward reform. While we have reached may milestones on the path to reform, more work needs to be done. You are invited to join us on this path and learn more about the key issues in adoption and foster care adoption today in this SlideShare presentation: Adoption in America Today: The Good, the Bad, and a Path to Reform. Strong families build strong communities and strong communities make a better world for all of us.